These gorgeous cupcakes are very special – they’re fun and fruity and while they look good enough to eat, they’re actually treats for your skin! 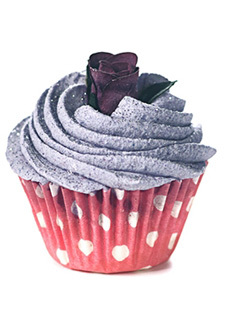 Cup cake bath bombs and melts by Miss Patisserie are at the perfect price this week. The fizzy bubbles exfoliate your body while you bathe, leaving you feeling as good as they smell. The Lily from the Valleys bomb is now only £3. It’s fun and fruity with undertones of manderin. If you fancy some edible cakes, check out our Raspberry Cupcake recipe.